We are excited to announce that Eyes as Big as Plates will be exhibited for the first time in its entirety at Fotogalleriet in Oslo next week, welcome to the opening reception Thursday January 23rd at 19:00 pm. The exhibition will be open from January 24th – March 2nd 2014. Fotogalleriet is pleased to present the exhibition Eyes as Big as Plates, a first-time comprehensive presentation of the on-going collaborative project by Karoline Hjorth and Riitta Ikonen. The natural world acts as both content and context in this work, with the characters literally inhabiting the landscape. 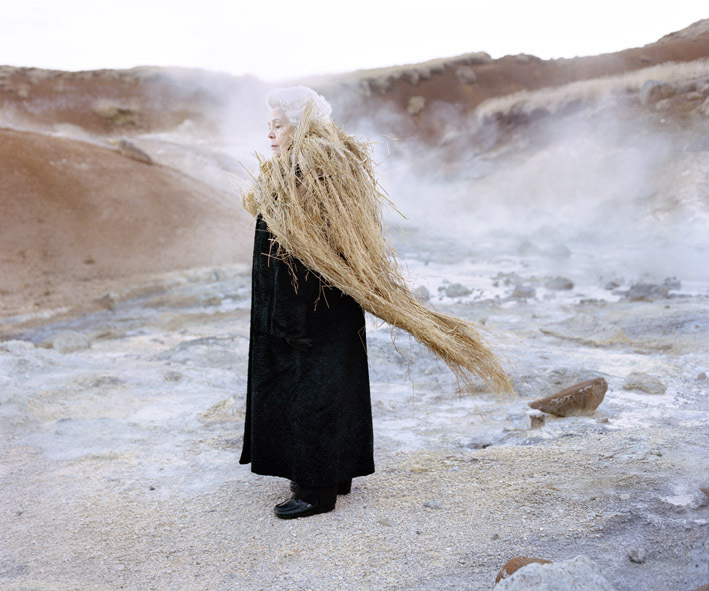 The production of each image further involves a certain collision of temporality: the fleeting instant of the photographic moment, the more ‘mythic’ time created within the image and the participants’ mental transition as they become one with their wearable sculpture and the surrounding natural landscape. Eyes as Big as Plates is produced in collaboration with retired farmers, fishermen, zoologists, plumbers, opera singers, housewives, artists, academics and ninety-year old parachutists. As active participants in our contemporary society, these seniors encourage the rediscovery of a demographic group too often labelled as marginalized or even as a stereotypical cliché. It is in this light that the project aims to generate new perspectives on who we are and where we belong.